Our deepest sympathies go to the Lessen family in the sudden passing of Dale. He was the secretary of our Board, Customer, but most of all our Friend. LINCOLN - Dale W. Lessen, 57, passed away at Memorial Medical Center on April 17, 2019. Dale was born in Lincoln, IL; son of William and Frances (Geriets) Lessen. He married Sarah Isbell on November 6, 1993, in Hartsburg, IL. She survives him. Also surviving Dale is his father, his daughters: Shelby Lessen of Peoria, IL and Ashley Lessen of Lincoln, IL; his sisters: Linda Maxey of Lincoln, IL, Colleen (Jim) Anning of Williamsville, IL, and Susan (Jim) Gehlbach of Lincoln, IL; and his faithful companion: Charlie. He was preceded in death by his mother. Dale was a member of the United Methodist Church in Lincoln, part owner of Cashless Racing, Secretary of Hartsburg Grain Elevator, but above all, he was a loving husband to his wife Sarah and the best dad in the world to his girls. Dale chose to be an organ donor and with the help of Gift of Hope others will live on. Services for Dale will be 10:00 a.m. Friday, April 26, 2019, at the First United Methodist Church in Lincoln with Rev. Michael Paulson and Rev. Brad Curtis, officiating. Visitation will be from 4:00-7:00 p.m. Thursday, April 25, 2019, also at the church. Burial at Hartsburg Union Cemetery will follow the service. Memorials may be made in Dale’s name to Gift of Hope, Logan County Relay for Life (American Cancer Society), and the First United Methodist Church. Services are entrusted to Fricke-Calvert-Schrader Funeral Home in Lincoln, IL. *Prices are subject to change without notice. Please call the office for price confirmation. We will now accept ROUND UP READY 2 EXTEND SOYBEANS. They have been approved for exports. In order to serve your needs better, please take advantage of our new text messaging alerts. 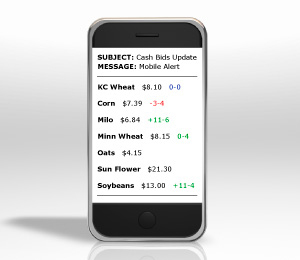 You can choose to receive futures open, mid-day, and closing CBOT prices along with our closing cash bids. We will also send out alerts on closings and harvest hours. Just click on the link above, or call the office and we will get you signed up. Lean Hogs Limit Down on Lack of Chinese Sales, Despite Sharply Higher Cutout Lean Hog futures are limit down in the June through August contracts.